These 40 LBS Used Rail Good Condition bought from railway auction are in excellent condition and can be used in place of new rails. We have only 17 tons left in 9.25 meter length. This is the last lot and we dont anticipate any further availability as no auction. We have ready stock of 40 Lbs Used Rail Good Condition in very good condition. The length available per piece is 7.15 to 9.15 mtr. Very limited stock. We are offering of 40 Lbs Used Rail in very good condition. 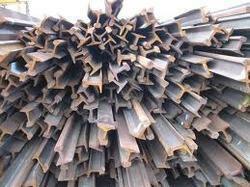 Our firm specializes in offering an excellent range of Used Rail. This innovative range of products are widely demanded in various industries for meeting diverse applications. To maintain industry defined quality standards, the entire range is manufactured using quality proven raw material and cutting-edge technology. Also, the entire range is examined properly by our quality controllers upon distinct parameters of quality. Looking for Used Rail ?